Marine organisms like Tubestra, shown on the front cover, are a rich source of organic compounds with interesting and potent biological activity. Organic compounds derived from such living sources are called natural products. Bengamide A comes from an orange encrusting sponge. This compound, as well as a host of analogs, has unique anti-tumor properties currently being exploited to develop new anticancer agents. Jasplakinolide, also found in a sponge, modulates the formation and depolymerization of actin microtubules ubiquitous to all cells. This compound has been used to improve our understanding of biological processes like cell division. A closer look at these compounds reveals some fascinating elements of molecular architecture. There are six chirality centers in each of these molecules (Chapter 4). Also present in each are novel amino acid (Chapter 21) and lipid (Chapter 24) derivatives. The distinct biological activity of both molecules has motivated synthetic chemists worldwide to plan and execute elegant total syntheses (Chapter 29). 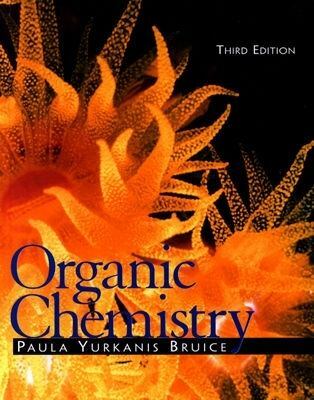 These are just two of many examples of how natural products are key players in contemporary research linking organic chemistry to other disciplines.Paula Yurkanis Bruice is the author of 'Organic Chemistry (3rd Edition)', published 2000 under ISBN 9780130178589 and ISBN 0130178586.